The design of the 1963 Lotus 27 Formula Junior car followed the principles of the 1963 Lotus 25 Formula One car featuring a monocoque. Keen to save weight, cost and promote the use of fibre glass which Colin Chapman used extensively in the Lotus Elite and Elan models the 27 monocoque initially differed from the bigger, aluminium skinned, Lotus 25 monocoque by having a fibre glass outer skin. Former motor cycle racer and film distributor Ron Harris ran the works Lotus Formula Junior team in 1963 for 1962 Formula Junior champion Peter Arundell, Mike Spence and John Fenning. With only one car available for Peter first time out at Oulton Park the team scored a lucky victory after the faster Brabhams including that of Denny Hulme retired with engine problems. The victory was lucky because the monocoque was so weak it badly affected the handling of the Lotus 27. 5 or 6 Lotus 27 chassis are thought to have been constructed with fibre glass outer skins and nearly 4 months past before Peter returned to his winning ways by which time the fibre glass outer skin of his Lotus 27’s monocoque had been replaced by rolled aluminium which stiffened the monocoque and improved the 27’s handling. With 6 successive late season wins Peter Arundell secured his second successive British Formula Junior title by one point over Denny Hulme. 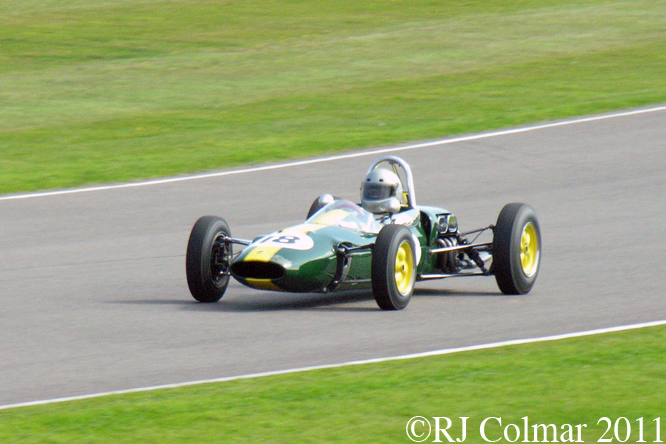 Chris Locke is seen above at the Goodwood Revival in his Lotus chassis 27-JM-22. This car was sold originally to one C Haas, better known these days as the racing impresario the multi championship winning Newman/Hass/Lanigan Indycar team. 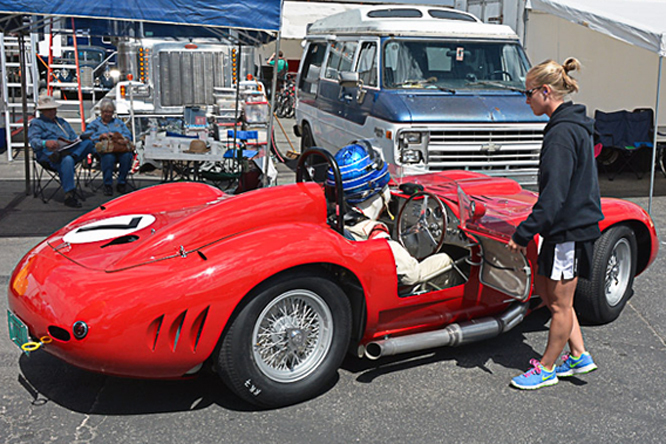 According to San Anselmo CA resident Lotus aficionado Chris Locke’s website, Carl sold the car to General Motors who wanted to study the monocoque engineering and design, some years later General Motors donated the Lotus to the auto shop department of a Detroit high school. Teacher Pat Nelson liberated the car by substituting a more practical vehicle for his students to learn from before the racer had been dismantled. 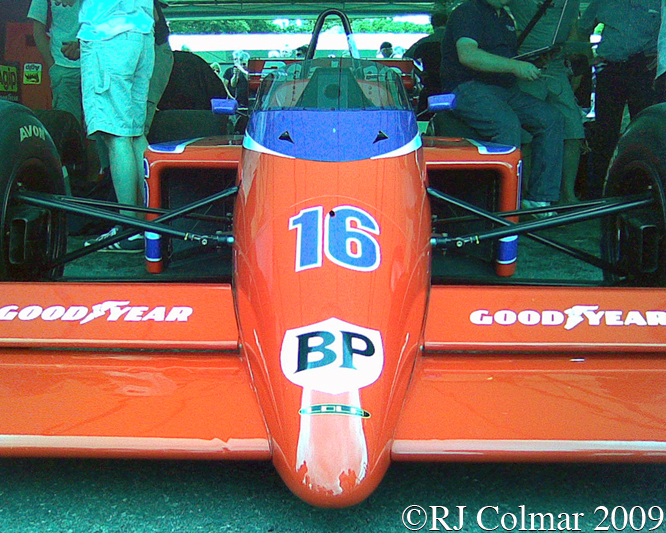 Pat raced 27-JM-22 from the late 60’s to mid 70’s before Jim Lloyd took over the car in 1977 and raced it some more. 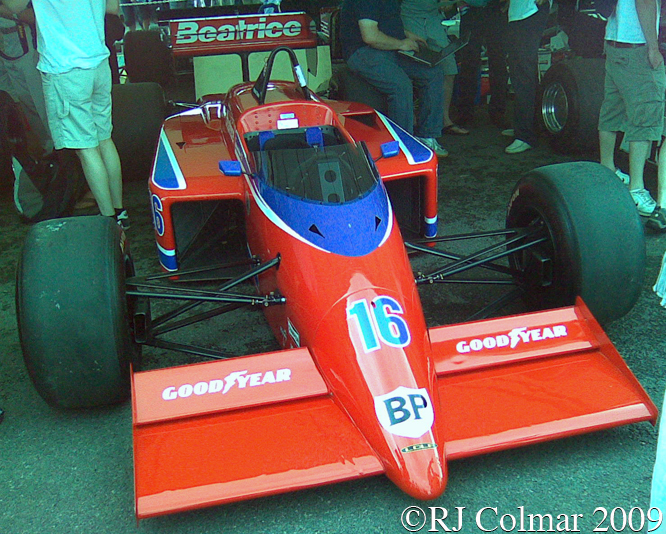 Jim was photographed with his 27 – JM – 22 parked next to Mario Andretti’s championship winning Lotus 79 at the US Grand Prix in 1978. 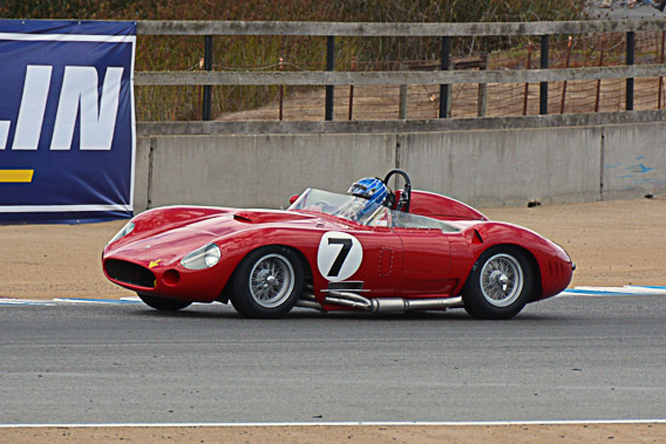 Six successive owners owned and raced the car the last of which had a the tub replaced after an accident in 1999. Chris became the owner in 2001 and has the car looked after John Anderson Racing in the States and Historic Team Lotus in Europe. 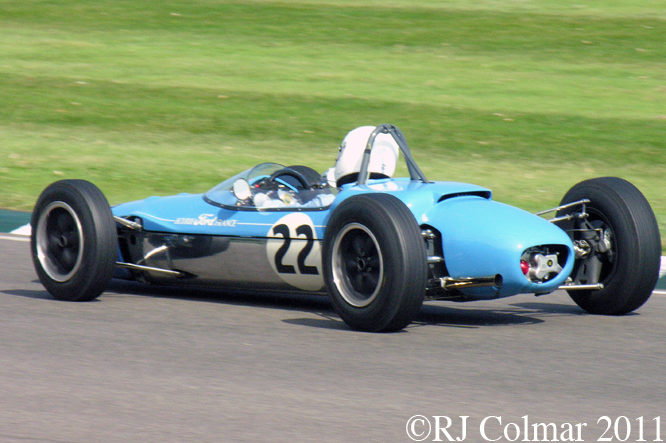 The second Lotus 27, 27-JM-2, featured today driven by Nick Fennell above was acquired for Jean Vinatier by Ecurie Ford France on the 28th May 1963, The team were running tragic future Grand Prix driver Jo Schlesser in a rival Brabham BT6 at the same time. Of the two Jo scored better and consistent results until the August 18th 1963 when Jean recorded fastest lap on his way to two heat wins and win on aggregate in a French Formula Junior Championship at Nogaro. Jean recorded a further 3rd place at Montlhéry near Paris before the seasons end. Jean went on to become French National Rally Champion in an Alpine Renault in 1969 and represented the same team at Le Mans a track at which he recorded 15 24 hour race starts between 1950 and 1973. Thanks to Peter, Pete, willga, and Ron at The Nostalgia Forum for their comments on the 27’s construction. Thanks for joining me on this ‘Too Much Added Lightness’ edition of ‘Gettin’ a li’l psycho on tyres’, I hope you will join me again tomorrow. Don’t forget to come back now ! 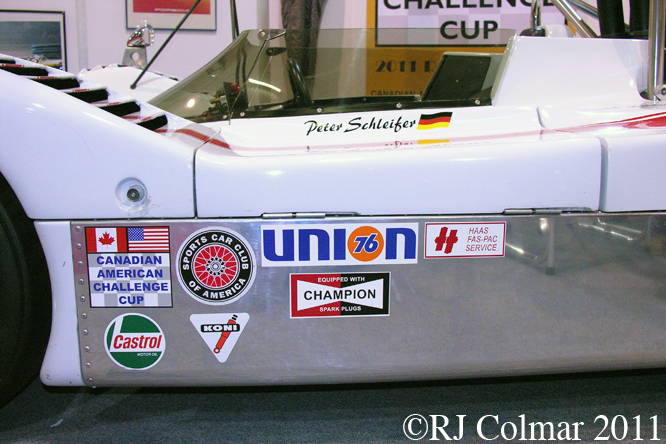 This entry was posted in Uncategorized and tagged 27, 27-JM-2, 27-JM-22, Colmar, Ecurie, Ford, France, GALPOT, General, Goodwood, Haas, Lotus, Motors, Ralph, Revival, Viatier on January 28, 2012 by Ralph. 1972 proved to be the year that the Penske turbo Panzer dominated Can Am in much the same way as the hitherto mercurial McLarens. 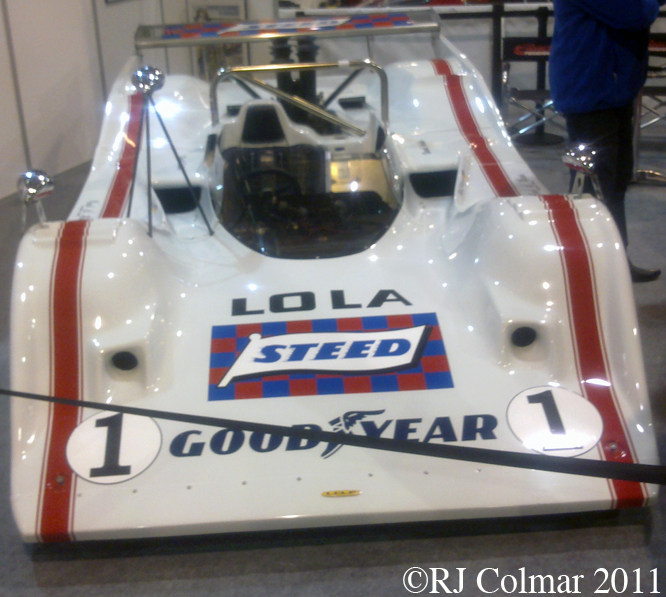 The original 1966 Can Am series champion constructors Lola had started with fresh from scratch designs in 1970, ’71 & ’72, the vehicle seen here is the Lola T310 from 1972. 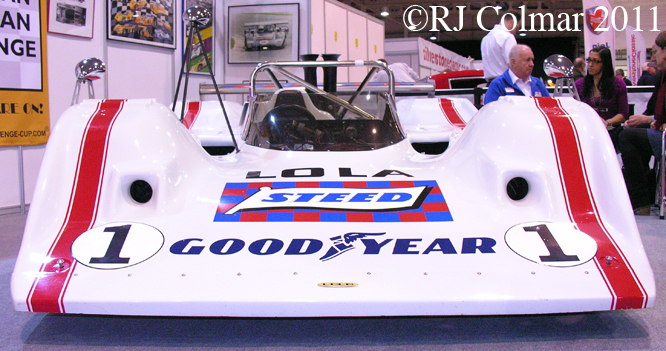 To overcome the under steering (push) characteristics Jackie Stewart had complained of driving the stubby L&M; Lola T260 during 1971, Eric Broadley & Specialised Mouldings developed this body work, measuring 4.527 meters / 180″ long by 2.172 m / 85.5 ” wide, in a wind tunnel to hug one of the largest Can Am monocoques ever built. The monocoque was full width and unusually full length so that the engine could be mounted without the need of a separate steel sub frame. David Hobbs was given the responsibility of driving the T310 for Carl Haas during the 1972 season but the car was completely outclassed, David managed just one season high 4th place and came in 7th in the final ’72 Can Am standings. The car was sold at the end of 1972 and Jerry Hansen managed to win a minor race at Atlanta, the car ended its competition days in the 1977 5 litre/ 305.5 cui Can Am series in the hands of Bruce Langson. 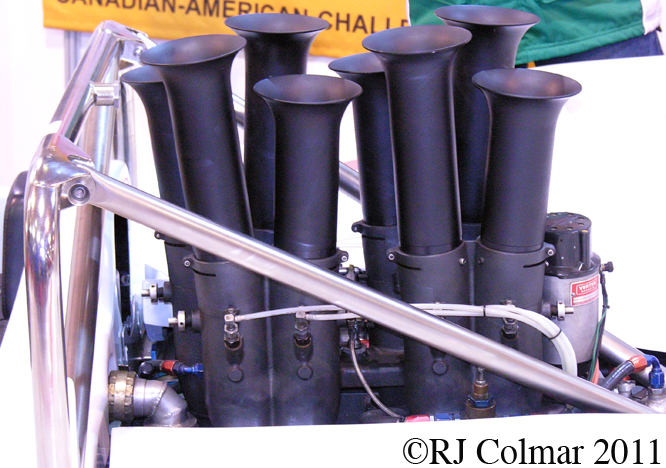 Power for the T310 came from the mighty 8.1 litre / 494 aluminium Chevrolet V8, according to World Champion and twice Can Am champion Denny Hulme the motor was good for a maximum of 760 hp, regrettably this top estimated performance was completely outclassed by the conservative estimated 1000 hp plus the turbocharged flat 12 cylinder Porsche’s were kicking out at the time. You can see and hear the T310 driven by Bobby Rahal in 2008 in this splendid little youtube clip. Hope you have enjoyed today’s Can Am edition of ‘Gettin’ a lil’ psycho on tyres and that you’ll join me again tomorrow. Don’t forget to come back now ! 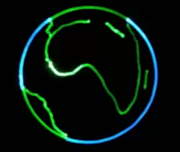 This entry was posted in Uncategorized and tagged Am, Art, Bobby, Broadley, Bruce, Can, Carl, David, Eric, Haas, Hansen, Hobbs, Jerry, Langson, Lola, Psycho, Rahal, T310, Tidesco, Tyres on March 6, 2011 by psychoontyres.